These are the opening lines of Nella Bielski's exquisite new novel The Year is '42. The first chapters are set in occupied Paris (right). Despite the Nazi presence the artistic salons continue, and the dinner companions of German officer Karl Bazinger companions includes Jean Cocteau and Coco Chanel. But the arrival of another German officer, Hans Bielenberg, who appears to be involved in resistance activities disturbs the idyll. Bazinger has attracted the attentions of the SS, and volunteers for a transfer to the Eastern Front. Bielenberg meets his fate, and Bazinger is posted to the Ukraine. There he becomes involved with a beautiful female Russian doctor whose life is devastated by mass deportations to the gulag, and the massacre at Babi Yar. In the UK pacifist Michael Tippett composed the second of his five string quartets; the complete cycle being an addition to the 20th century chamber music repertoire equal in stature to the Shostakovich Quartets. In 1942 Benjamin Britten returned to the UK from the US, and composed his Hymn to St Cecilia. Meanwhile the US had entered the war following the Japanese raid on Pearl Harbour in December 1941, and the symphonic repertoire was expanded by Leonard Berstein's first (Jeremiah), Henry Cowell's third, Walter Piston's second, and Roy Harris' fifth. Back in The Year is '42 , the central characters in the novel are slowly, and inexorably drawn into the tragedy and horror that was the Russia struggle aginst the Nazis. But, although the themes of this taut, but powerful, novel are bleak the conclusion is optimistic. The redemptive power of both humanity and the arts finally shines through, and the Russian doctor takes on the role of a shaman as she reverses some of the evils of the occupation. Author Nella Bielski was born in the Ukraine, and studied philosophy at Moscow University before leaving Russia in the 1970's. She now lives in Paris, and writes in French. (The excellent English translation is by John Berger). The Year is '42 is a minor masterpiece. It combines beautifully observed scenes set in France and Russia with heart wrenching insights into a society being torn apart by war. It will surely take its place among the other classic books and music that chronicle this terrible period. This link is worth following to a fine article on the historical context of Shostakovich's 'Leningrad' Symphony. 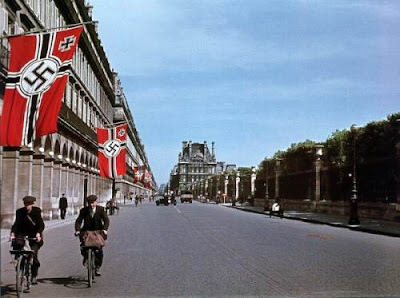 Header photo is from an astonishing collection of photos of Nazi occupied Paris. It is 1942. The Japanese have taken Singapore. The Lufwaffe is bombing Malta, and the RAF Lübeck. Paris is occupied. The Nazi forces, unable to take Moscow, have switched direction and are advancing towards the [oil fields of the] Caucasus. By 1942, the Nazis have also already terror bombed Wielum, Frampol, and Warsaw, Poland; Rotterdam; London and Coventry; partially leveled Minsk; destroyed hundreds of towns and villages in Belarus; laid siege to Leningrad (for 900 days) and Stalingrad; and leveled parts of many cities in Ukraine including Kyiv, Kharkiv, and Odesa. Manhattan Project has begun; Japanese Americans are held in detention camps in the Western United States; the jeep has been invented; and the U.S. has won the battle of Midway turning back Japanese naval superiority. In 1942 I was 10 years of age. The only inconvenience I felt was the rationing of sugar, gas and butter. I was grateful my father wasn't called up. He worked the ship yards at night readying battleships for the war. Thanks for turning me on to Nelle Bielski's new book, "The Year is 1942". I devour all books of this period of Earth's bloody history and this one sounds most interesting. Overgrown Path is the most interesting of blogs. Not one trace of narcissism.